This great collection contains 30 crowns, 10 each of Guelph Millennium, Mondeo and Pacific Purple. Guelph Millennium Bred in Canada this all male variety has good vigour and high yields – good to plant with Mondeo as it crops later in mid to late May. One of the hardiest varieties. Mondeo The earliest variety we know of, producing juicy spears from early May. The spear tips remain tight throughout the season and plants have good disease resistance. 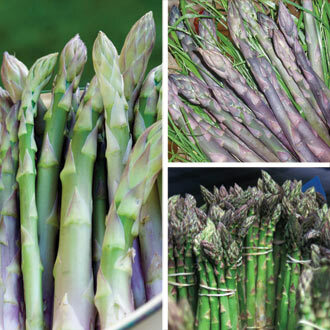 Pacific Purple Just delicious with tender, sweet tasting spears ready for harvesting from mid May. Very high yielding and thought to be higher in antioxidants than green types, it can also be eaten raw. Save £12 on individual prices! Last Order Date: Despatch: From 28th April 2019. Planting asparagus crowns in the Autumn helps you to achieve a harvestable asparagus bed one year earlier than if planting in the Spring – planting crowns in the ground warmed by the summer sun helps them to establish sooner.